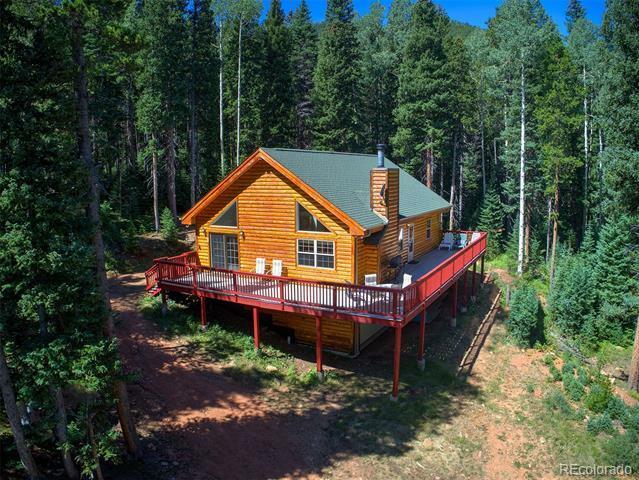 Perfect Rocky Mountain cabin in secluded setting next to stream. Yet only 15 minutes to Evergreen or Highway 285. Almost two and a half beautifully wooded acres. Cabin has vaulted ceiling, open floor plan and great room with wood stove. Rounding out the main level, there are two bedrooms and a full bathroom/ laundry room. Upper level loft is currently being used as a bedroom. Lower level walkout contains a family room, powder room/ utility area, and bonus room. Two car oversized attached garage has workshop area. Relax and decompress in this wooded, secluded enclave yet enjoy all the modern conveniences of home!